Also known as The PALgorithm™, examPAL's patented technology will personalize the course to fit your schedule, level and the way you think and will match you with the right questions at the right time, teach you the solutions that are the best for you, and provide real-time feedback on how to improve. Take your time or run through the course. You are no longer required to organize your time around a class schedule and waste time commuting, only to fight for the attention of the tutor with 20 other students. Study at the comfort of your home, or while travelling, and get a learning experience more personalized than with a private tutor. Start studying for free with lessons that will take you from complete basics to GRE mastery. Learn faster, practice better. Technology is awesome. 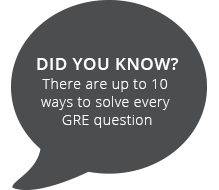 The GRE is all about solving questions quickly & correctly. So are we.